Stamp with Kathya: More Sunday Stamps Pink! Edited: My card was Narelle's Pick for the Freshly Made Challenge #119! Yay! Thank you Narelle! Happy Sunday Stampers! Hope your weekend is going well. I'm spending my time creating so I'm having lots of fun! 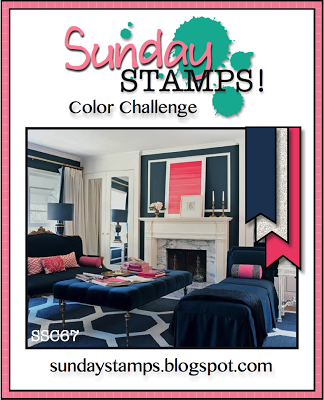 There's still time for you to join us for our Sunday Stamps color challenge! The deadline is this Friday, January 24, 2014 at 6 pm EST. Thanks to all of you who have played so far, great creations!! I combined our color challenge with the current sketch from Freshly Made Sketches for my creation today. 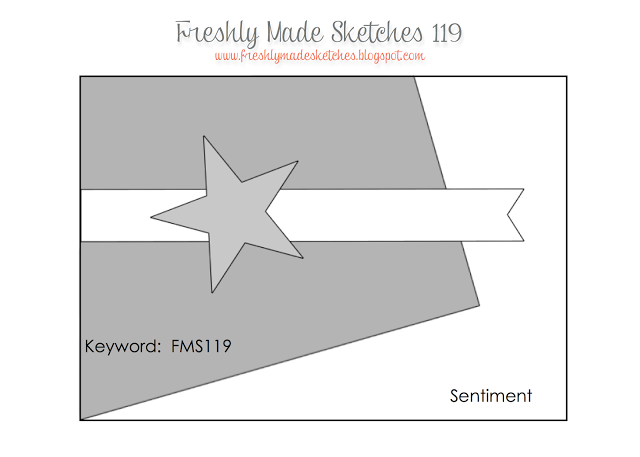 Great non-traditional layout and lots of inspiration with this sketch at their blog. The base of my card is Night of Navy and I layered with Strawberry Slush. I used the side of the Kaleidoscope DSP in Strawberry Slush but covered the colored triangles so you wouldn't see them. The Happy Birthday sentiment is embossed in white so that it would stand out more. Thanks for stopping by! Enjoy your Sunday and until next time! Kathya this is such a gorgeous card! I'm loving this striking colour combo and the glimmer paper adds that bit of extra pizzazz! Thanks for joining us at Freshly Made Sketches this week!